What is mPOS (mobile point of sale)? An mPOS or mobile POS is a portable point of sale (POS) on a smartphone or tablet that functions as a register for taking payments. A mobile POS system is an ideal way for businesses such as food trucks, home and repair services, market stalls, etc. to take credit card payments on the go. By selecting mPOS software for your business, you can download the POS app, connect your reader to a mobile device and start taking payments instantly. When shopping for the best mobile POS for your business, look for one that is secure, easy to use and affordable. Look for a mobile POS system that’s simple to use with an intuitive interface so it’s easy to get employees trained quickly. Square started with the simple idea that everyone should be able to accept credit cards. Even now, many mobile businesses remain “cash only” because standard POS terminals are clunky and certainly not portable. Plus, signing up with a traditional credit card payment processor can be prohibitively expensive, especially for seasonal or micro businesses. Square is here to provide an alternative option. We make mobile POS software and compatible hardware that work together seamlessly, allowing sellers to take debit and credit card payments on the go. 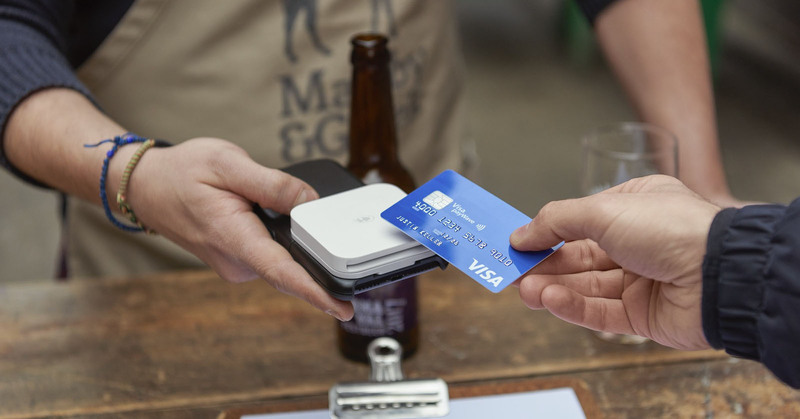 Accept chip and PIN, contactless and mobile payments everywhere. The Square Reader fits in the palm of your hand and is a great mPOS because it connects wirelessly to let you take chip and PIN and NFC payments (like Apple Pay) anywhere. Make sure you’re set up to accept every payment method. The reader costs just £39, making this mobile POS affordable as well as portable. Square charges just 1.75% for chip and PIN, contactless and mobile paymemts like Apple and Samsung Pay. There are no monthly fees, commitments or surprises. Square’s reader comes with a free backup magstripe reader for international cards that fits into the headset jack of your smartphone or tablet and, along with our free POS app, transforms your device into a mobile POS system even for international customers. Sign up for your free account and then download our free POS app, a powerful point of sale that’s easy to use. Key in credit card payments at 2.5% per transaction, or use a reader for lower rates (1.75%) and protection against eligible chargebacks. For chip and PIN cards or contactless payments like Apple Pay, make sure your Square Reader is paired with your mobile device. Select an item from the item library, or key in an amount and tap Charge. Then insert the chip card in the slot or have your customer touch the device to the reader for an NFC payment. Square’s mobile POS system integrates beautifully with third-party apps to help you run your entire business on the go or in your back office. Simplify your accounting with Xero. E-commerce integrations are easy with BigCommerce. If you need a custom mPOS, you can work with developers to create a tailored solution for your business using our Point of Sale API. Is a mobile POS the right solution for your business? Mobile POS systems are ideal for businesses on the go that want to take credit card payments, such as food trucks, plumbers, landscape architects, mobile beauty businesses, electricians, movers and artisans at craft fairs, among others. Now you know what you need to consider when choosing the right mPOS for your business.